I wanted a book to read from recommendations. So I asked my friends on Facebook for a suggestion. 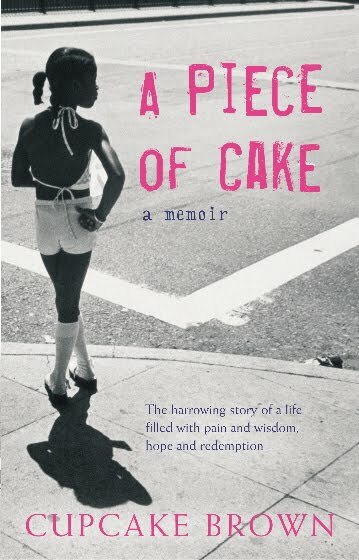 Overwhelmingly most suggested A Piece of Cake by CupCake Brown. The book is described as….. Following her mother’s death, Cupcake was just eleven years old when she entered the child welfare system. Moved from one disastrous placement to the next, like so many, she was neglected and sexually abused. She developed a massive appetite for drugs and alcohol – an appetite fed by hustling and turning tricks – and before long, stumbled headlong into the wild, notoriously dangerous world of the gangsta. But ironically, it was Cupcake’s rapid descent into the nightmare of crack cocaine addiction that finally saved her. After one crack binge she woke up behind a dumpster. Half dressed and more than half-dead, she finally knew she had to change her life or die. I highly recommend this book . I enjoyed the fact that it had a spiritual link to it as well. You have to read it. I have just started reading this book today, its been gathering dust on my bookshelf for a while now. I love memoirs so am looking forward to reading it! I read this in a day. Fab book!